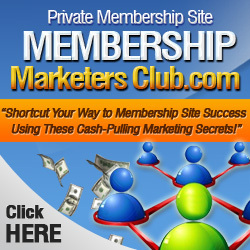 Membership sites are one of the best online business models that you can use. There are many different types of membership sites that you can start so there’s no reason why you shouldn’t make them part of your Internet marketing strategy. Reselling information to your market on a monthly basis is a smart way to go! This is one of the most popular benefits of starting a membership site. When you build a membership site you’ll have 100, 200 or even 500 members paying you on a monthly basis for your information. Imagine the possibilities! With a $15 monthly membership fee, you could be looking at a $7500 a month just for one site. If you provide more content and charge a higher price for your membership site, you could be earning well over six figures a year for your site. Affiliates love membership sites. If they have a choice between recurring monthly income and a one-time ebook sale in the same niche, they are going to spend their time promoting the membership site. They are looking for the same type of recurring income that you are. You can easily set up your affiliate program through ClickBank, 2CheckOut or PayDotCom. Promote your affiliate program to your members and super affiliates to get more sales. No other platform allows you to have widespread coverage on a niche the way that a membership site does. Within the gates of your membership site, you can offer a wide variety of content. In addition to articles and short reports, you can do teleconferences, videos and interviews. The more content you put into your membership site and the more members you have, the more your content and your recommendations will be respected within the niche. There’s no faster way to brand yourself as an expert within your niche than by creating a membership site. All your future content and products in the niche will have a lot more clout. The income from a membership site doesn’t stop with the monthly membership fees. There are plenty of opportunities to make additional income from your site. You can sell private tutoring, advanced products and platinum memberships. You can also repackage part of the content used in your membership site and sell it as an independent product. You can sell advertising as well to boost the profitability of your membership site. 5. It’s Never Been Easier! It has never been easier to run a membership site, especially if you don’t have any technical expertise. It used to be that you would need the help of a web programmer to get a membership site set up properly. Thanks to easy to use content management systems like WordPress and membership site scripts that will make security easy, you can have your membership site set up within a matter of hours. There’s no reason why you shouldn’t start one today. What is Facebook All About?